First year student, Emily Tasker, shows Channel 5 audiences what life is like at the Human Anatomy Resource Centre. Anatomists at the University of Liverpool have been working with a television production company to create a documentary series that, for the first time, depicts the experience of body donation from the perspective of donors, anatomy students and surgeons. The two-year project allowed television cameras to follow the lives of two cancer patients, in life and after death, depicting their experiences of terminal illness and the work of staff and students at the University’s Human Anatomy Resource Centre (HARC), who use the donated bodies for learning and research. 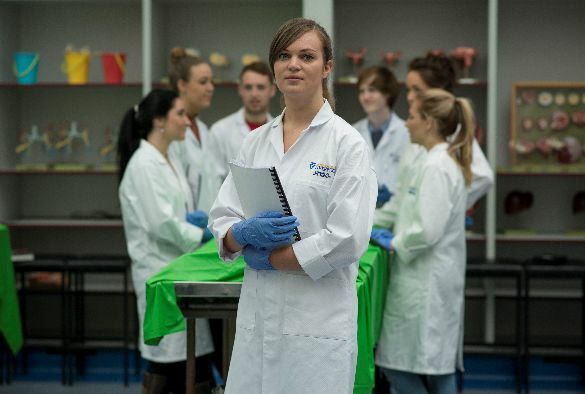 The series, due to air on Channel 5 on Tuesday, 29 September and Tuesday 6, October at 9pm, addresses the importance of hands on learning for students studying the human body. The cameras follow Liverpool students as they are introduced to a cadaver for the first time. 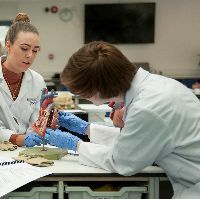 Derby Professor of Anatomy and Cell Biology, Jim Gallagher, said: “Those who donate their body to medical science provide an incredible gift not only to students wanting to enter the medical profession, but trained professionals furthering their skills in surgical technique. “We wanted to open our doors to the cameras to show members of the public a honest picture of what body donation involves so they can make an informed decision on whether this is something they could see themselves committing to or not. The programme, produced by Daisybeck Studios, depicts the experience of first-year student Emily Tasker, as she starts her first whole-body dissection class and undertakes extra-curricular work in Africa, helping children overcome serious illness. The HARC is home to 16 staff members and more than 1,000 students, with bequeathal requests of up to 900. It has been the top ranked human anatomy department in the Guardian league tables for the past two years. Daisybeck Executive Producer, Paul Stead, said: “It was important for us to show how donors’ bodies take on a life of their own as they become a learning tool for anatomy students and help scientists master pioneering techniques. The documentary displays the dignity and respect the donors and their families deserve, also the gratitude from the staff and students for their precious gift. It is an honour to be part of team.